After 16 years of dedicated service, Howard College of Arts and Sciences Associate Dean Rosemary Fisk and Assistant Dean George Keller will step away from their administrative roles to return to full-time classroom teaching, beginning in the 2017–18 academic year. Fisk shared a large role in the founding of Samford University’s Core Curriculum and has served as director of that signature program since 2001. She took up the mantle of associate dean in 2001, and has provided excellent leadership in the areas of general education and faculty development. She also played key roles with the creation of the Howard College Advisory Board, the Old Howard 100 bike ride and J. Roderick Davis Lecture Series, the college’s most visible public outreach initiatives. ­Fisk will take a well-earned sabbatical in fall 2017 to retool for the classroom. In spring 2018, she will remain on a half-time administrative appointment to assist with faculty development activities, including review, clarification and dissemination of college guidelines for preparation of tenure and promotion materials. Keller has shepherded Howard College programs for recognition and promotion of student scholarship and achievement, as well as providing invaluable coordination of programs and resources in science and mathematics. He is currently serving as interim chair of the Department of Biological and Environmental Sciences, and will retain that position until the search for a new chair of the department is concluded. In addition to his role as assistant dean, Keller has long served as adviser of the Prehealth Professions Programs and as director of the Alabama Governor’s School. He will retain those roles as he returns to the classroom. 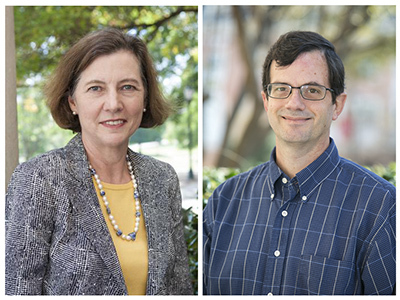 Hall announced that Emily Hynds, currently chair of the math and computer science department, and Don Bradley, currently chair of the sociology department, will join his staff as associate deans. Hynds will assume many duties currently managed by Fisk, focusing particularly on the strategic areas of faculty and leadership development. In addition, she will assist with analyzing the school’s budget and bringing it into greater alignment with Howard College’s strategic plan. Bradley will provide leadership in the areas of assessment and general education.